Maine has a well-known heritage of boatbuilding. Much of its history can be seen on display at the Maine Maritime Museum in Bath. But that is another post for another day. If you would like to sail a bit of history, our friends at Portland Schooner Company have just the thing! 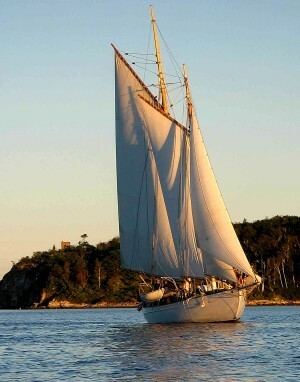 Their two antique schooners, Wendameen and Bagheera, are both vintage Maine-built boats, designed by renowned yacht designer John Alden and built in East Boothbay. Wendameen was launched in 1912, and has a great history as a fast, private ocean schooner. Her story is told in Wendameen, Life of an American Schooner, by Capt. Neal Parker. There is more information about Wendameen on Captain Parker’s website. Bagheera, in her turn, was a Bermuda racer, then was taken to the Great Lakes, where she won the Chicago-Mackinac race several times. Both boats have been fitted out for passenger transport, and sail from Portland, providing two-hour cruises, private charters, overnight sails, and more. We work with Portland Schooner Company for our Sail into the Sunset package, our Fall Foliage Surf & Turf package, as well as arranging a two-hour cruise for guests who would like a bit more than the average tour of Casco Bay! Come on and sail an old wooden schooner! How often do you get a chance like that?